There are many people who do not understand the diversity of experiences, conditions and in some cases medical complexity that make up the CP community. I have heard people’s confusion in my own conversations with friends, family members and strangers who often think CP is a similar experience for everyone. I also have seen people in CP groups on social media trying to support one another but missing vital information to offer the right kind of insight. It is critical that in discussing CP people provide background information about what CP looks and feels like in their experience. As an example, you need to know something about an individual’s motor function, type of movement disorder and treatment goals before discussing treatments that fall under the broad category of CP. The one commonality that people with CP share is that each person has had either an early brain injury or a one-time disturbance in brain development (EDBI) that has led to varying degrees of problems with motor function, muscle coordination and balance. But the conditions and problems individuals may face do not usually end with movement. The EDBI may have lead to other conditions that impact daily life. These conditions, and how severely they affect the individual and family, often become embedded in conversations about CP and how it is portrayed and discussed. It’s important to keep this in mind when talking about “Cerebral Palsy” and to have clarity (when appropriate) about what that means to the person speaking. 2. Communication difficulties including speech and hearing-Some people with CP have a lot to say but no way to communicate despite the diversity of communication devices on the market. 3. Learning difficulties-There may be a diversity of barriers to learning and it’s important that these components are identified and addressed individually. For instance, there may be medications interfering with processing, the child may be tired from sleep disturbances, epilepsy may interfere with learning and visual and hearing impairments may also cause problems. 4. Intellectual disabilities-Some people with CP have intellectual disabilities. At the same time some people with CP may be incorrectly perceived as having an intellectual impairment or a more severe intellectual impairment because of their posture, or the difficulty they may have with speaking. 5. Sensory integration impairments-There is so much to learn and understand here but people with CP may have difficulty organizing and acting upon the information coming through their sensory centers (i.e vision, hearing, touch, vestibular). 6. Visual processing disorders (how visual info is processed by the brain)-Visual processing disorders like cortical visual impairment (CVI) can cause significant problems with learning and can be easily missed by educators. 7. Ocular impairments (how the eyes mechanically work)-People with CP may need glasses and may have problems coordinating eye movements. 8. Behavioral or psychological conditions such as anxiety disorders, depression and bi-polar disorder-The mental health of people with CP is often overlooked but it’s becoming clearer to clinicians and researchers that this is an area that needs more attention. 8. Problems with eating/swallowing-Some individuals may have difficulty coordinating and using the muscles needed to eat and swallow food which may require adjustments to the textures of the foods they eat, using a straw for liquids (Maya does this) or having a feeding tube. 9. Bowel and bladder dysfunction-In CP the muscles throughout the body can be affected including the ones that control bowel and bladder functions. Constipation is very common and can be hard to manage. There can also be problems with bladder control or urinary tract health that also relates to the muscle control in those areas. 10. Changes to the onset of puberty-When the infant brain has been injured or disturbed during development, this can also mean that the pituitary gland which controls puberty has been affected as well. Increasing numbers of children with disabilities are experiencing early or late onset puberty. 11. Sleep disorders–These can be severe and exacerbate other conditions like behavioral issues and learning and also affect the rest of the family. 12. Chronic PAIN–A big issue among people with CP, especially for adults with CP. 13. Muscle/bone problems that lead to contractures–muscles fixed in a rigid position–and scoliosis-These may require treatments and/or surgical interventions. 14. Hydrocephalus-fluid on the brain. I share this information not to dwell on the negative aspects of what can occur when someone has had an EDBI, but to illustrate the complexity and range of the disorders that one may experience. It’s very important to me and to Maya that people don’t get so caught up in her differences that they cannot connect with her as they would any other child. 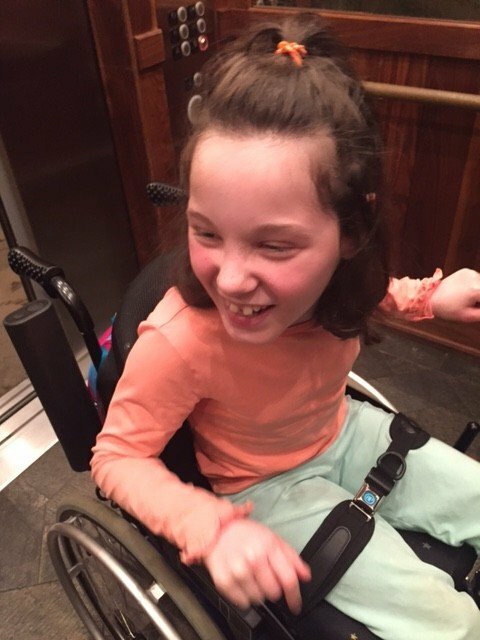 For this reason, I do my best to focus on Maya’s strengths, but there are days where I struggle to support her body’s most basic functions like sleeping, going to the bathroom, or trying to keep seizures at bay. I think it’s important for people to understand these issues as well. Some families struggle and worry every day about helping their children eat, drink, sleep, breathe and remain comfortable in their bodies, and they often don’t have the energy to advocate for themselves. Other individuals may be facing great pain and are concerned about losing function, including the ability to walk, and still others may feel their barriers to communication impact their participation and quality of life more than any other symptom or condition with which they are coping. I am committed to educating people about early brain injury and CP, and ensuring that people’s strengths are recognized while also acknowledging the diversity of concerns individuals face that need to be considered when mobilizing change for the direction of research, treatment and quality of life. 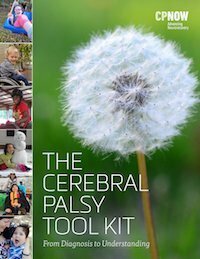 **To learn more about the work I am doing for the CP community please join me on Facebook and visit CP NOW, our fundraising organization focused on education, support and funding pilot studies. Pilot studies are the first phase of scientific research where new and innovative ideas are brought forth for initial safety and efficacy testing. The CP community is in great need of new ideas and treatments, and before researchers can go on to secure larger grants or federal dollars, they need to find money for pilot studies which often comes from private organizations like ours. Wow, this is so interesting. I have a mild motor disablity (my parents don’t remember whether it was ever diagnosed as CP), probably as a result of hydrocephalus. I face many of these issues, some of which are embarrassing. For example, I’ve had bowel problems for as long as I remember but wasn’t diagnosed with chronic constipation (I had no clue it was that) till I was in my twenties. I also know that some CP people drool and I do this on occasion too. It is infrequent enough that my parents never sought medical help for it, instead blaming it on poor behavior. I sought help for it when I was in my twenties too and discovered I have slightly weak oral muscles. I knew that CP could cause a variety of issues before I knew what exactly it is or that I might have a mild form of it. I am too embarrassed to go to a doctor to ask to be diagnosed (maybe they think I exaggerate my problems). Anyway, wanted to thank you for this post.